3/24/2017 3:57 PM Advanced Troubleshooting with Debug Diagnostics on IIS 6 Chris Adams Program Manager IIS Product Unit Microsoft Corporation © 2005 Microsoft Corporation. All rights reserved. This presentation is for informational purposes only. Microsoft makes no warranties, express or implied, in this summary. 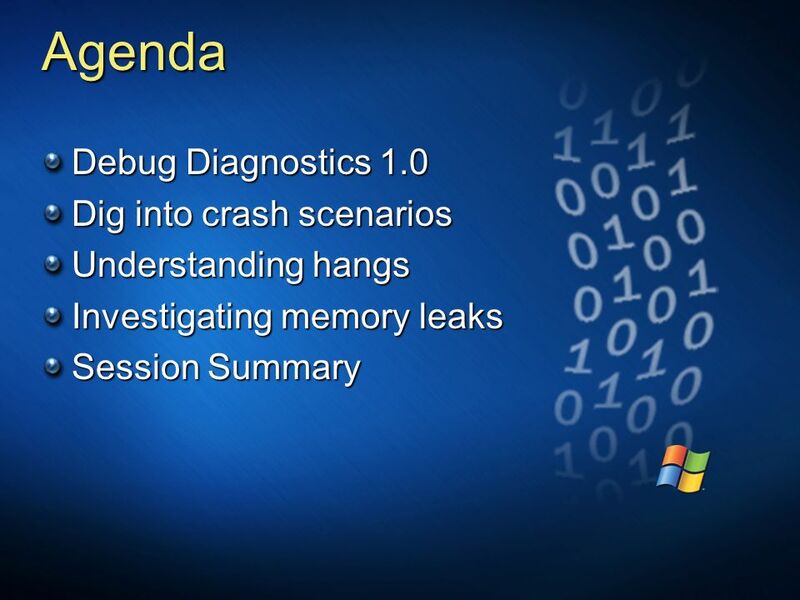 3/24/2017 3:57 PM Agenda Debug Diagnostics 1.0 Dig into crash scenarios Understanding hangs Investigating memory leaks Session Summary © 2005 Microsoft Corporation. All rights reserved. This presentation is for informational purposes only. Microsoft makes no warranties, express or implied, in this summary. 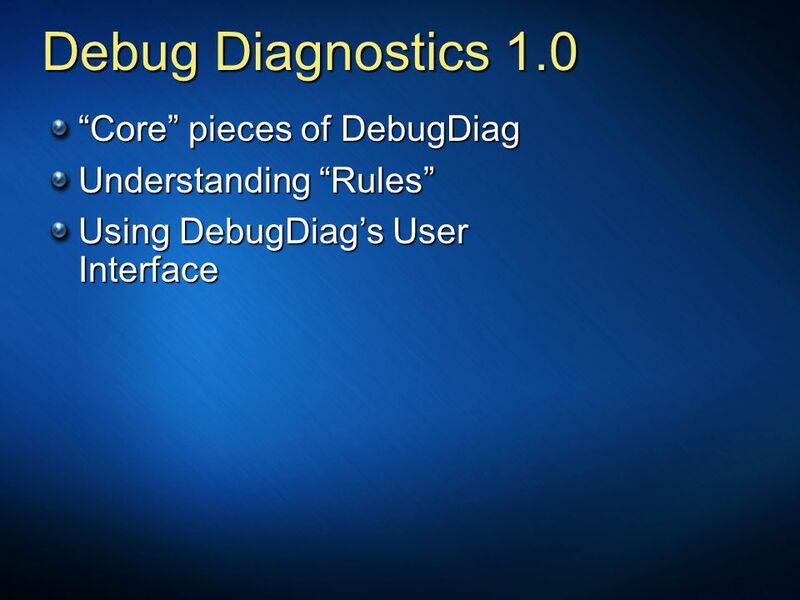 3/24/2017 3:57 PM Debug Diagnostics 1.0 “Core” pieces of DebugDiag Understanding “Rules” Using DebugDiag’s User Interface © 2005 Microsoft Corporation. All rights reserved. This presentation is for informational purposes only. Microsoft makes no warranties, express or implied, in this summary. 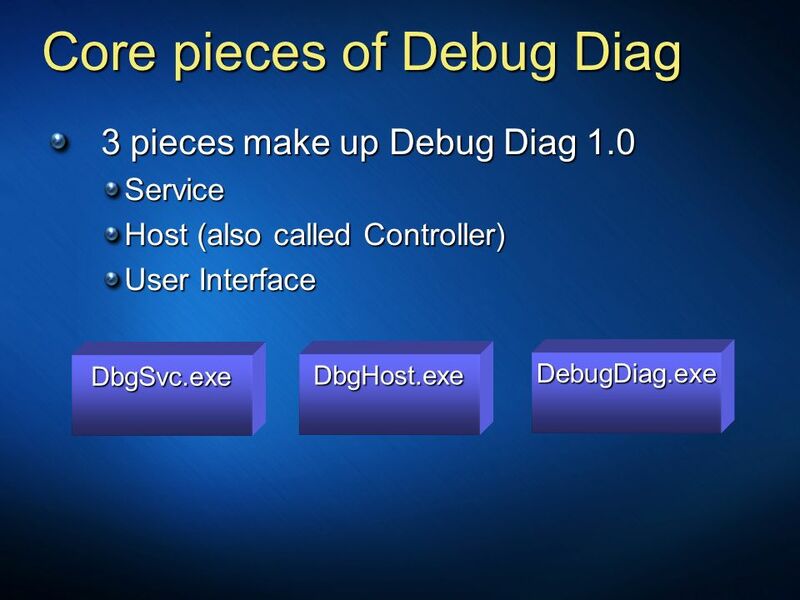 3/24/2017 3:57 PM Core pieces of Debug Diag 3 pieces make up Debug Diag 1.0 Service Host (also called Controller) User Interface DbgSvc.exe DbgHost.exe DebugDiag.exe © 2005 Microsoft Corporation. All rights reserved. This presentation is for informational purposes only. Microsoft makes no warranties, express or implied, in this summary. 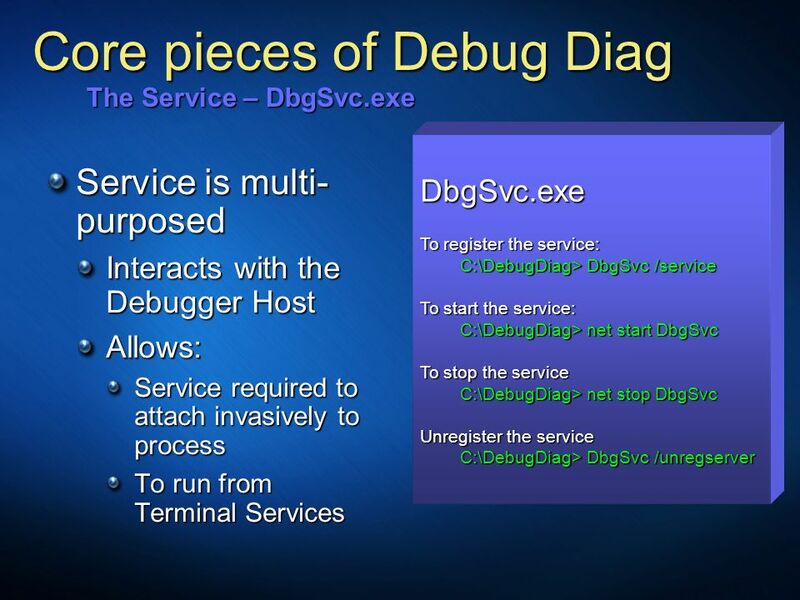 3/24/2017 3:57 PM Core pieces of Debug Diag The Service – DbgSvc.exe DbgSvc.exe To register the service: C:\DebugDiag> DbgSvc /service To start the service: C:\DebugDiag> net start DbgSvc To stop the service C:\DebugDiag> net stop DbgSvc Unregister the service C:\DebugDiag> DbgSvc /unregserver Service is multi-purposed Interacts with the Debugger Host Allows: Service required to attach invasively to process To run from Terminal Services © 2005 Microsoft Corporation. All rights reserved. This presentation is for informational purposes only. Microsoft makes no warranties, express or implied, in this summary. 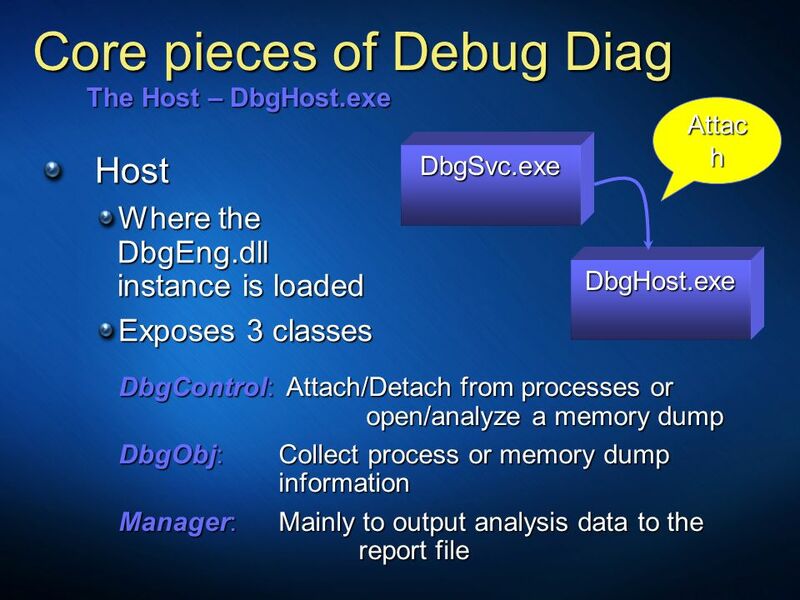 3/24/2017 3:57 PM Core pieces of Debug Diag The Host – DbgHost.exe DbgSvc.exe DbgHost.exe Attach Host Where the DbgEng.dll instance is loaded Exposes 3 classes DbgControl: Attach/Detach from processes or open/analyze a memory dump DbgObj: Collect process or memory dump information Manager: Mainly to output analysis data to the report file © 2005 Microsoft Corporation. All rights reserved. This presentation is for informational purposes only. Microsoft makes no warranties, express or implied, in this summary. 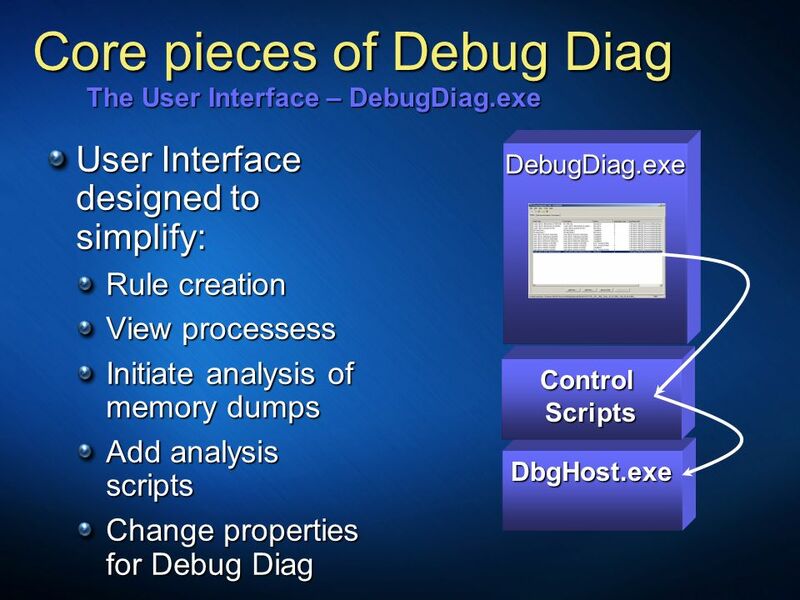 3/24/2017 3:57 PM Core pieces of Debug Diag The User Interface – DebugDiag.exe User Interface designed to simplify: Rule creation View processess Initiate analysis of memory dumps Add analysis scripts Change properties for Debug Diag DebugDiag.exe Control Scripts DbgHost.exe © 2005 Microsoft Corporation. All rights reserved. This presentation is for informational purposes only. Microsoft makes no warranties, express or implied, in this summary. 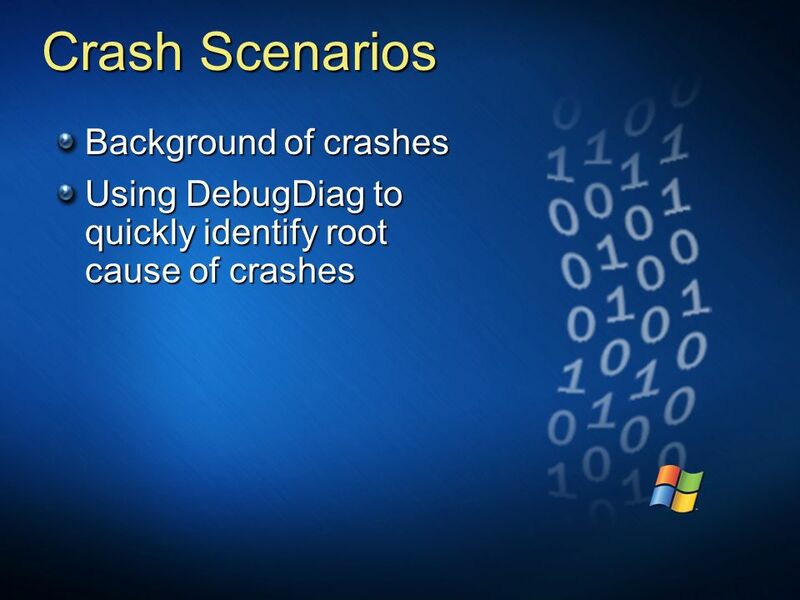 3/24/2017 3:57 PM Crash Scenarios Background of crashes Using DebugDiag to quickly identify root cause of crashes © 2005 Microsoft Corporation. All rights reserved. This presentation is for informational purposes only. Microsoft makes no warranties, express or implied, in this summary. 3/24/2017 3:57 PM Background: Exceptions What is an exception? 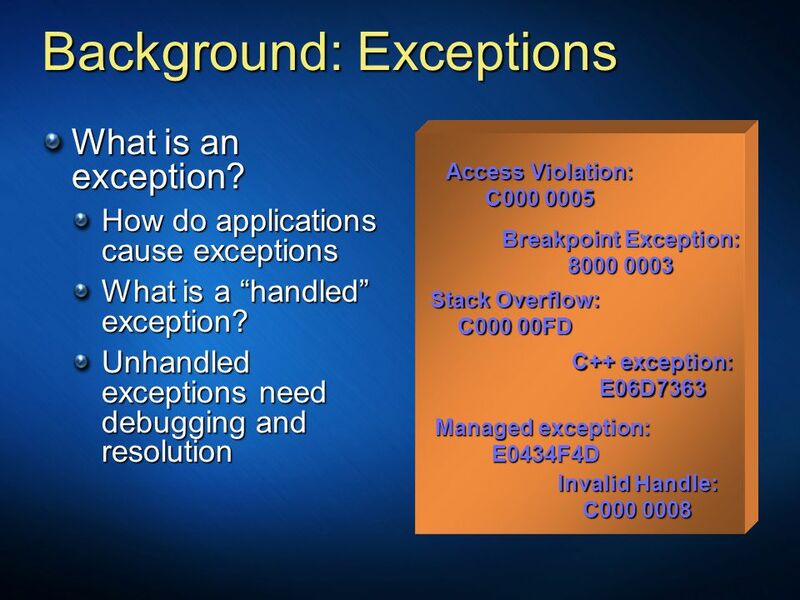 How do applications cause exceptions What is a “handled” exception? Unhandled exceptions need debugging and resolution Access Violation: C Breakpoint Exception: Stack Overflow: C000 00FD C++ exception: E06D7363 Managed exception: E0434F4D Invalid Handle: C © 2005 Microsoft Corporation. All rights reserved. This presentation is for informational purposes only. Microsoft makes no warranties, express or implied, in this summary. 3/24/2017 3:57 PM Background: Heap (2) What is a heap? 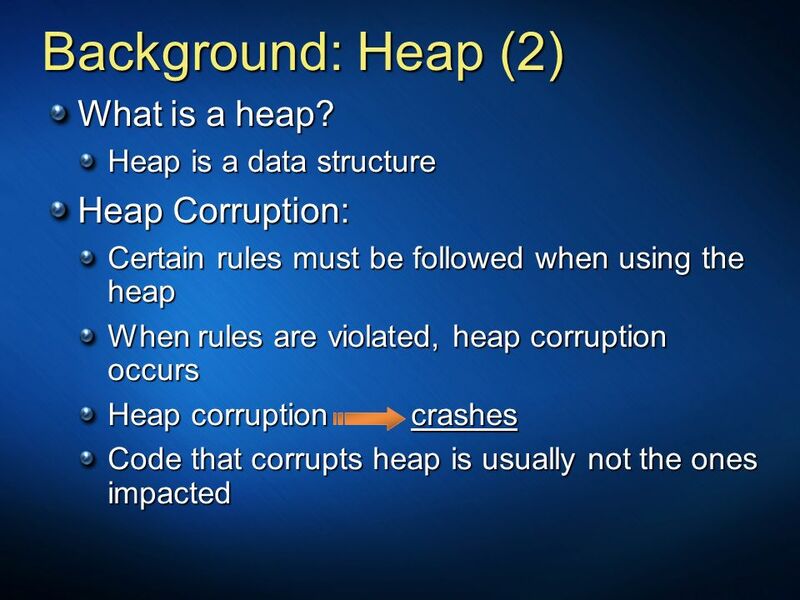 Heap is a data structure Heap Corruption: Certain rules must be followed when using the heap When rules are violated, heap corruption occurs Heap corruption crashes Code that corrupts heap is usually not the ones impacted © 2005 Microsoft Corporation. All rights reserved. This presentation is for informational purposes only. Microsoft makes no warranties, express or implied, in this summary. 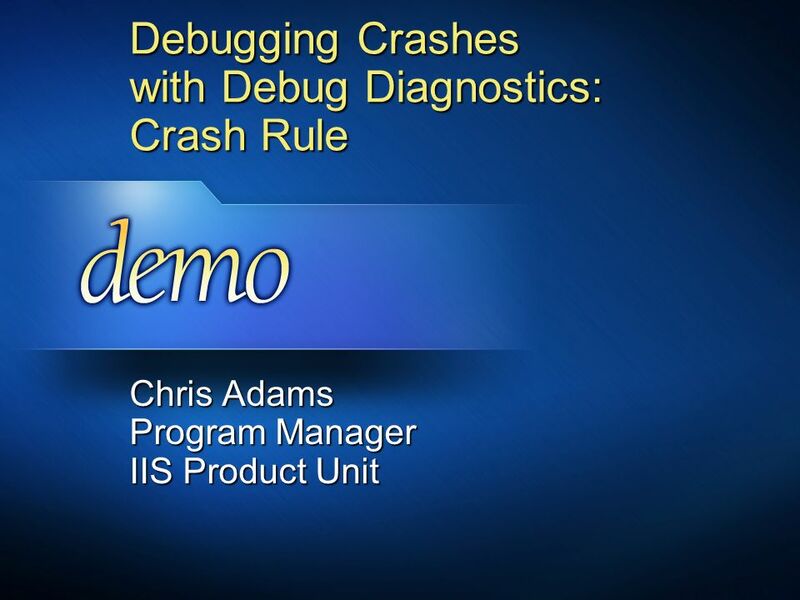 3/24/2017 3:57 PM Debugging Crashes with Debug Diagnostics: Crash Rule Chris Adams Program Manager IIS Product Unit © 2005 Microsoft Corporation. All rights reserved. This presentation is for informational purposes only. Microsoft makes no warranties, express or implied, in this summary. 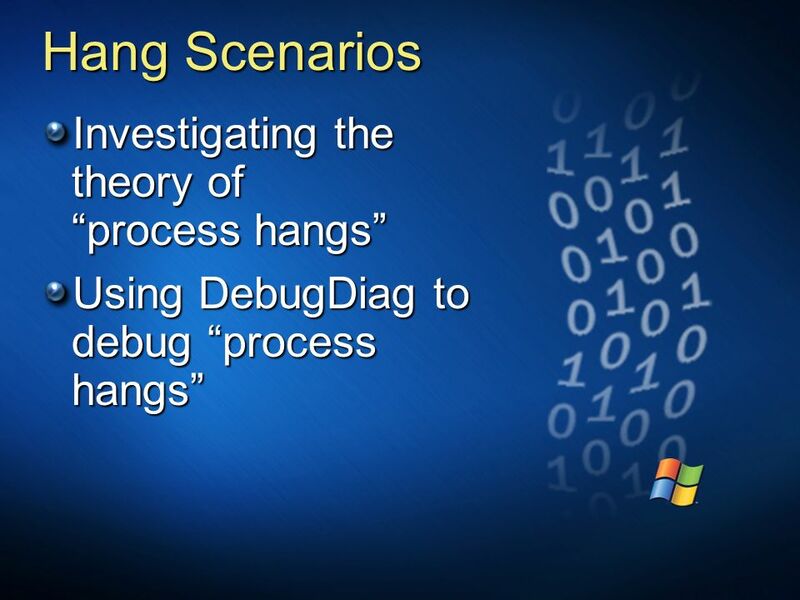 3/24/2017 3:57 PM Hang Scenarios Investigating the theory of “process hangs” Using DebugDiag to debug “process hangs” © 2005 Microsoft Corporation. All rights reserved. This presentation is for informational purposes only. Microsoft makes no warranties, express or implied, in this summary. 3/24/2017 3:57 PM Theory of “Process Hangs” What is a process? 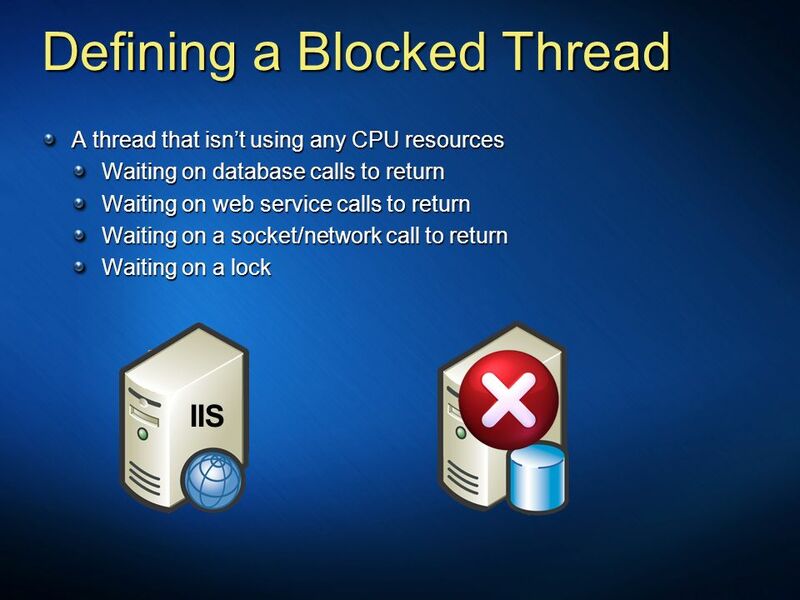 Memory boundary for execution of code Allocated by Operating System done by calling CreateProcess or CreateProcessAsUser API Processes do not execute code Contains a minimum of 1 thread What is a thread? An independent sequence of instructions executing within a process © 2005 Microsoft Corporation. All rights reserved. This presentation is for informational purposes only. Microsoft makes no warranties, express or implied, in this summary. 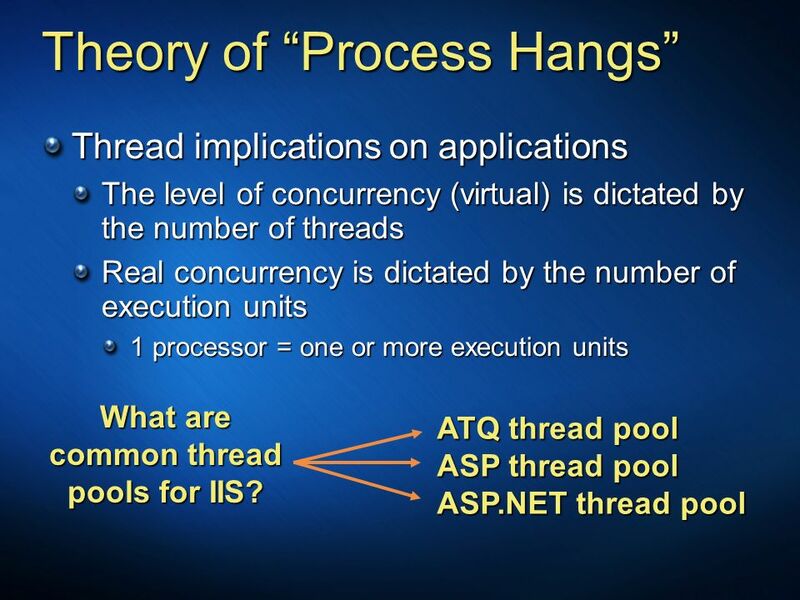 3/24/2017 3:57 PM Theory of “Process Hangs” Thread implications on applications The level of concurrency (virtual) is dictated by the number of threads Real concurrency is dictated by the number of execution units 1 processor = one or more execution units What are common thread pools for IIS? ATQ thread pool ASP thread pool ASP.NET thread pool © 2005 Microsoft Corporation. All rights reserved. This presentation is for informational purposes only. Microsoft makes no warranties, express or implied, in this summary. 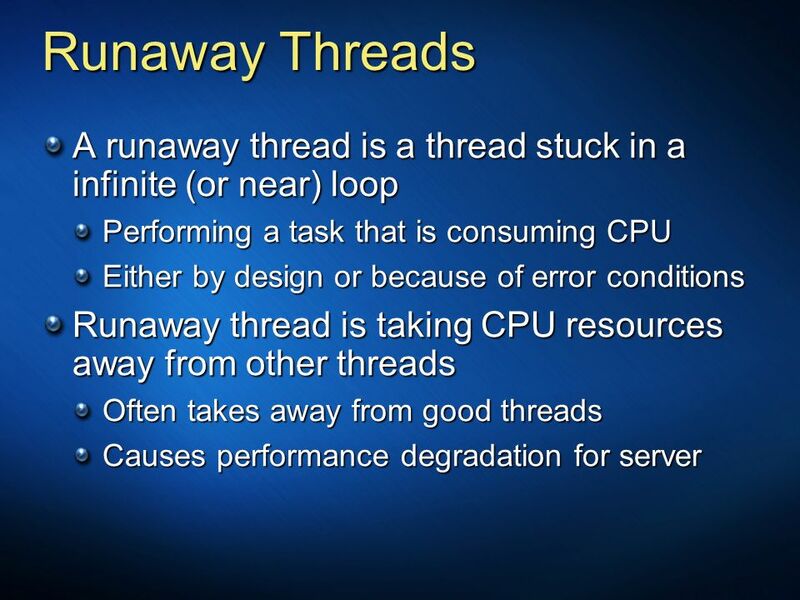 15 3/24/2017 3:57 PM Runaway Threads A runaway thread is a thread stuck in a infinite (or near) loop Performing a task that is consuming CPU Either by design or because of error conditions Runaway thread is taking CPU resources away from other threads Often takes away from good threads Causes performance degradation for server © 2005 Microsoft Corporation. All rights reserved. This presentation is for informational purposes only. Microsoft makes no warranties, express or implied, in this summary. 3/24/2017 3:57 PM Defining a Blocked Thread A thread that isn’t using any CPU resources Waiting on database calls to return Waiting on web service calls to return Waiting on a socket/network call to return Waiting on a lock IIS SQL Thread 3 Thread 4 Thread 1 © 2005 Microsoft Corporation. All rights reserved. This presentation is for informational purposes only. Microsoft makes no warranties, express or implied, in this summary. 17 Locks and Deadlocks What is a lock? Why do developers use locks? 3/24/2017 3:57 PM Locks and Deadlocks What is a lock? 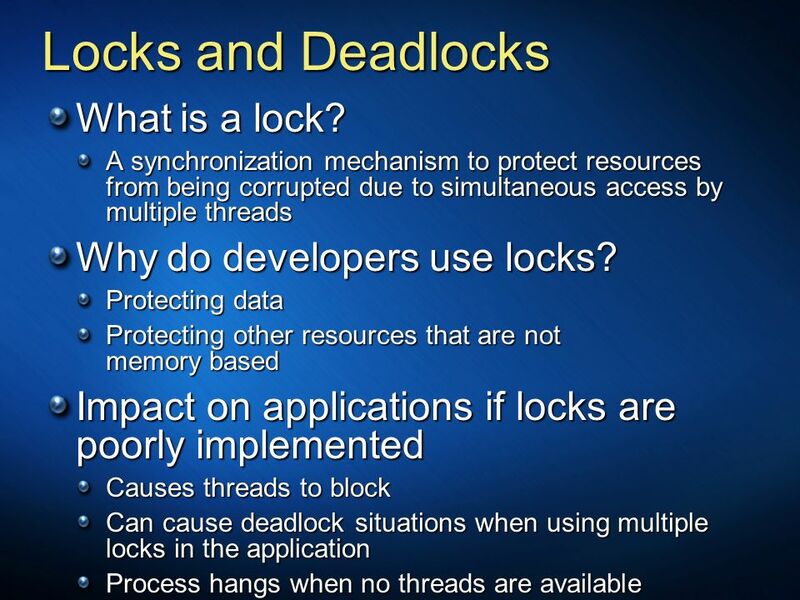 A synchronization mechanism to protect resources from being corrupted due to simultaneous access by multiple threads Why do developers use locks? Protecting data Protecting other resources that are not memory based Impact on applications if locks are poorly implemented Causes threads to block Can cause deadlock situations when using multiple locks in the application Process hangs when no threads are available © 2005 Microsoft Corporation. All rights reserved. This presentation is for informational purposes only. Microsoft makes no warranties, express or implied, in this summary. 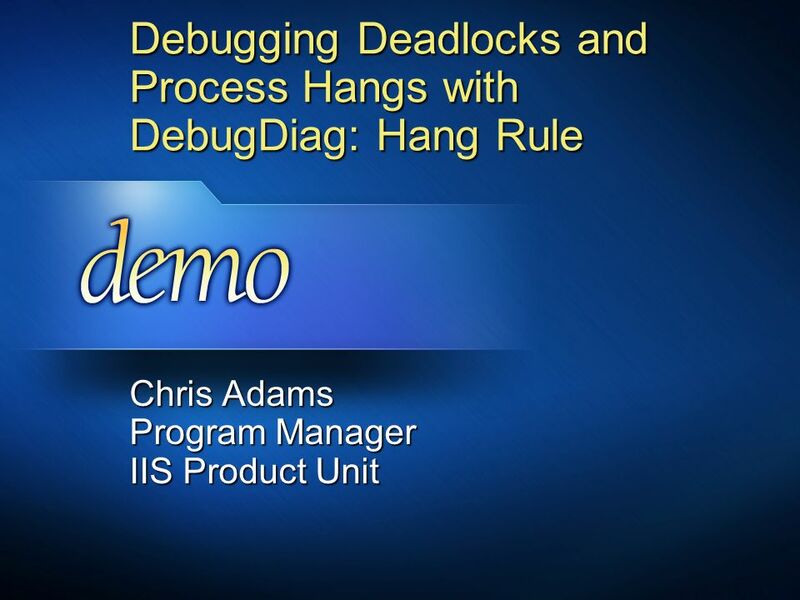 3/24/2017 3:57 PM Debugging Deadlocks and Process Hangs with DebugDiag: Hang Rule Chris Adams Program Manager IIS Product Unit © 2005 Microsoft Corporation. All rights reserved. This presentation is for informational purposes only. Microsoft makes no warranties, express or implied, in this summary. 3/24/2017 3:57 PM Looking into Leaks… What is a leak? 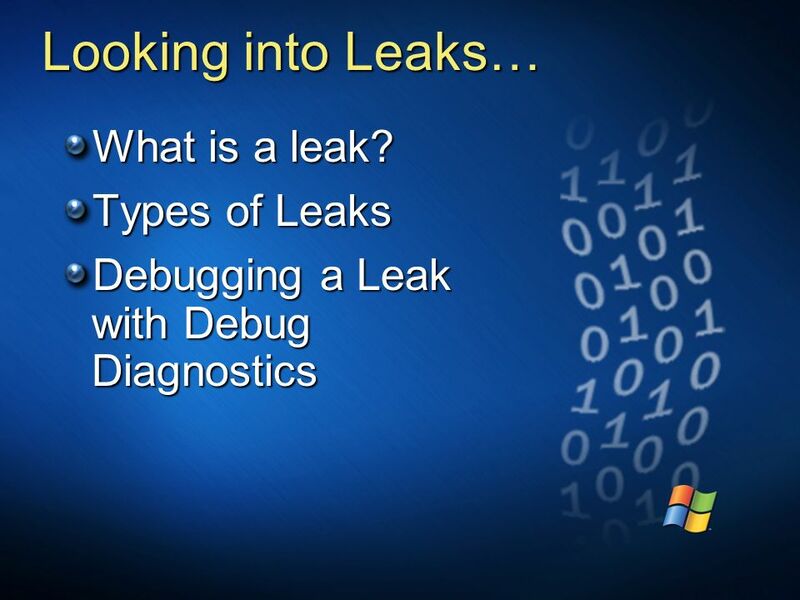 Types of Leaks Debugging a Leak with Debug Diagnostics © 2005 Microsoft Corporation. All rights reserved. This presentation is for informational purposes only. Microsoft makes no warranties, express or implied, in this summary. 20 Leak Scenarios (2) Why are leaks difficult to identify and resolve? 3/24/2017 3:57 PM Leak Scenarios (2) Why are leaks difficult to identify and resolve? Server applications often cache memory allocations The allocations are long term These applications, to outsiders, look to have memory leaks There are many other caches Using Performance Monitor and seeing memory growth does not equal a memory leak © 2005 Microsoft Corporation. All rights reserved. This presentation is for informational purposes only. Microsoft makes no warranties, express or implied, in this summary. 3/24/2017 3:57 PM Leak Scenarios (3) What are short-term allocations? 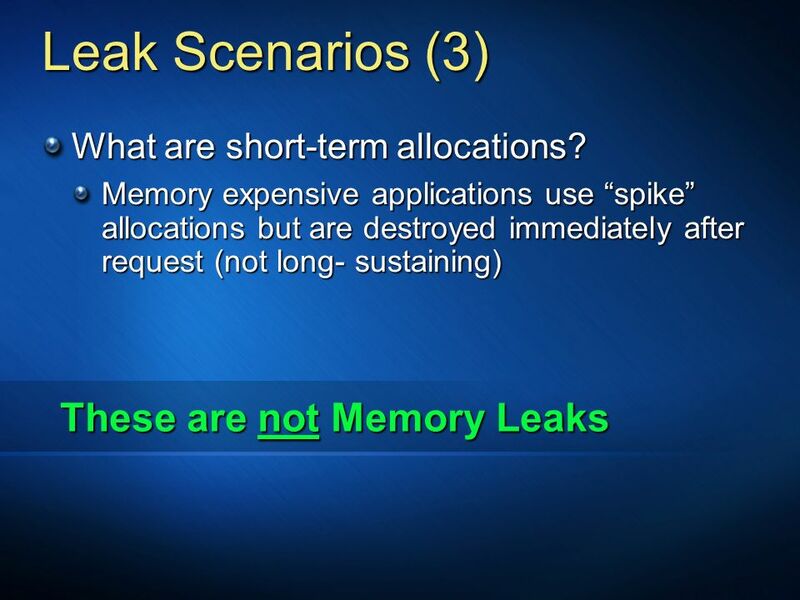 Memory expensive applications use “spike” allocations but are destroyed immediately after request (not long- sustaining) These are not Memory Leaks © 2005 Microsoft Corporation. All rights reserved. This presentation is for informational purposes only. Microsoft makes no warranties, express or implied, in this summary. 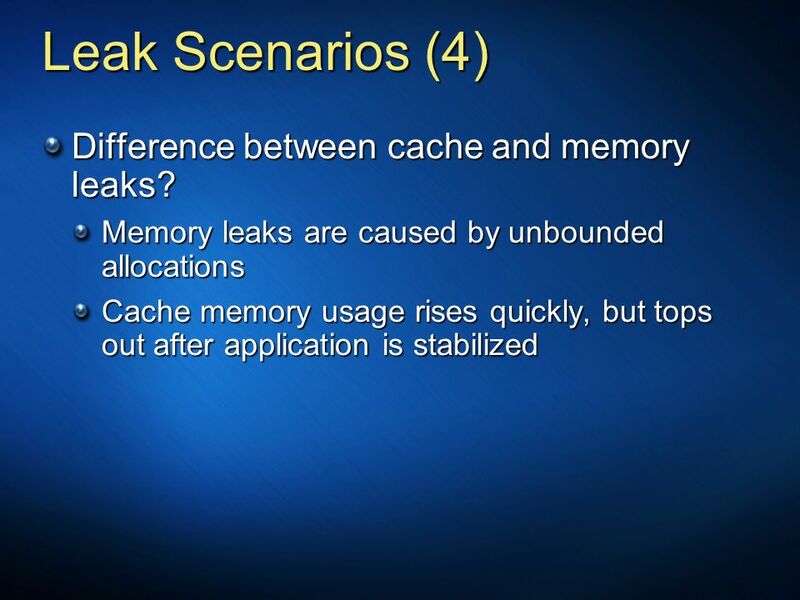 22 Leak Scenarios (4) Difference between cache and memory leaks? 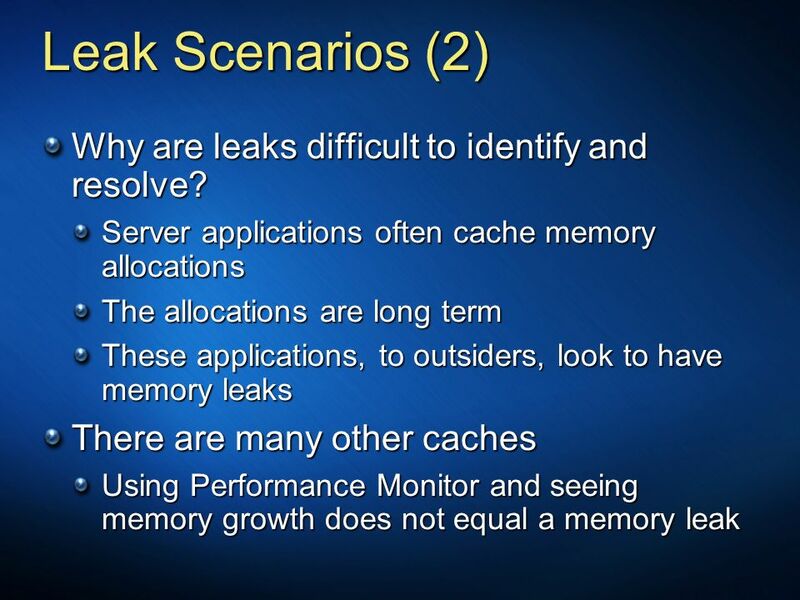 3/24/2017 3:57 PM Leak Scenarios (4) Difference between cache and memory leaks? Memory leaks are caused by unbounded allocations Cache memory usage rises quickly, but tops out after application is stabilized © 2005 Microsoft Corporation. All rights reserved. This presentation is for informational purposes only. Microsoft makes no warranties, express or implied, in this summary. 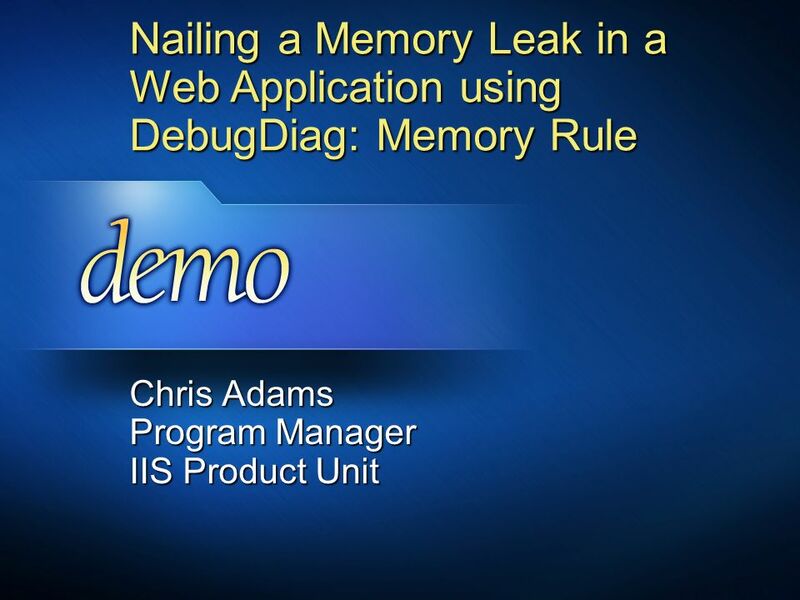 3/24/2017 3:57 PM Nailing a Memory Leak in a Web Application using DebugDiag: Memory Rule Chris Adams Program Manager IIS Product Unit © 2005 Microsoft Corporation. All rights reserved. This presentation is for informational purposes only. Microsoft makes no warranties, express or implied, in this summary. 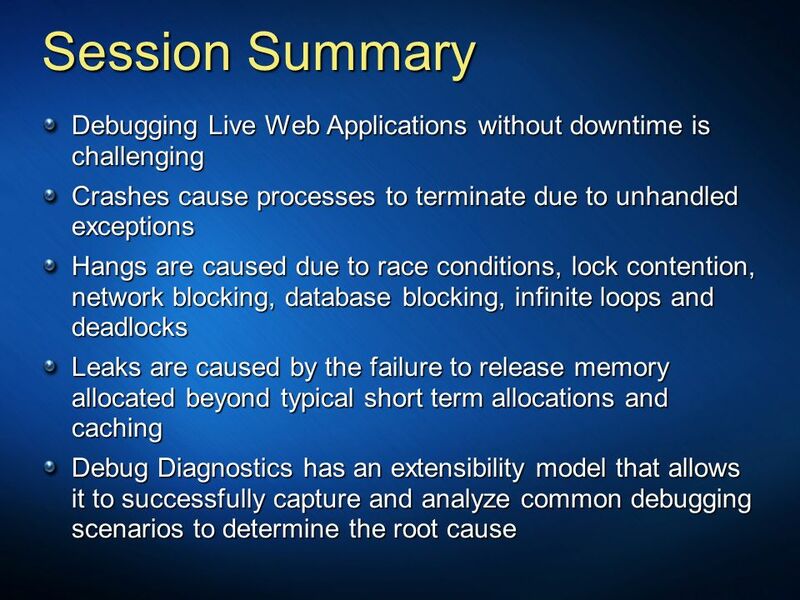 24 3/24/2017 3:57 PM Session Summary Debugging Live Web Applications without downtime is challenging Crashes cause processes to terminate due to unhandled exceptions Hangs are caused due to race conditions, lock contention, network blocking, database blocking, infinite loops and deadlocks Leaks are caused by the failure to release memory allocated beyond typical short term allocations and caching Debug Diagnostics has an extensibility model that allows it to successfully capture and analyze common debugging scenarios to determine the root cause © 2005 Microsoft Corporation. All rights reserved. This presentation is for informational purposes only. Microsoft makes no warranties, express or implied, in this summary. 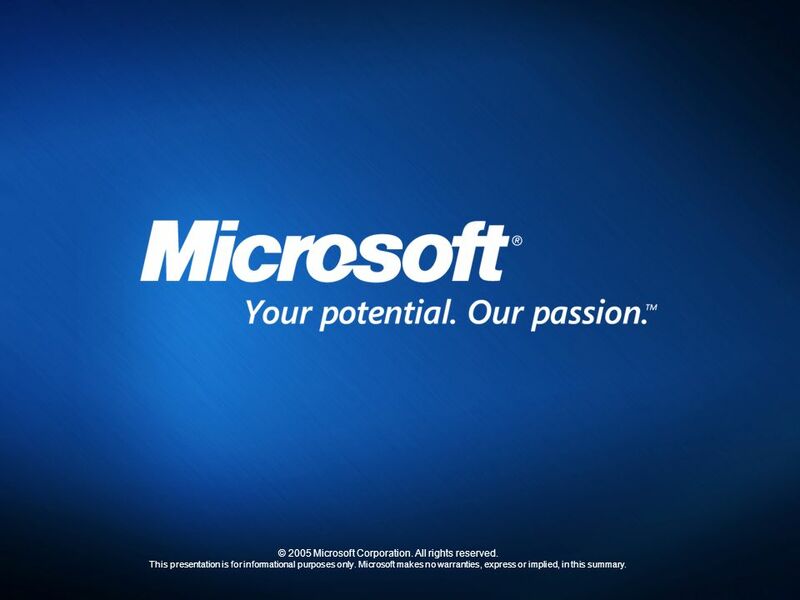 26 © 2005 Microsoft Corporation. All rights reserved. 3/24/2017 3:57 PM © 2005 Microsoft Corporation. All rights reserved. This presentation is for informational purposes only. Microsoft makes no warranties, express or implied, in this summary. © 2005 Microsoft Corporation. All rights reserved. This presentation is for informational purposes only. Microsoft makes no warranties, express or implied, in this summary. 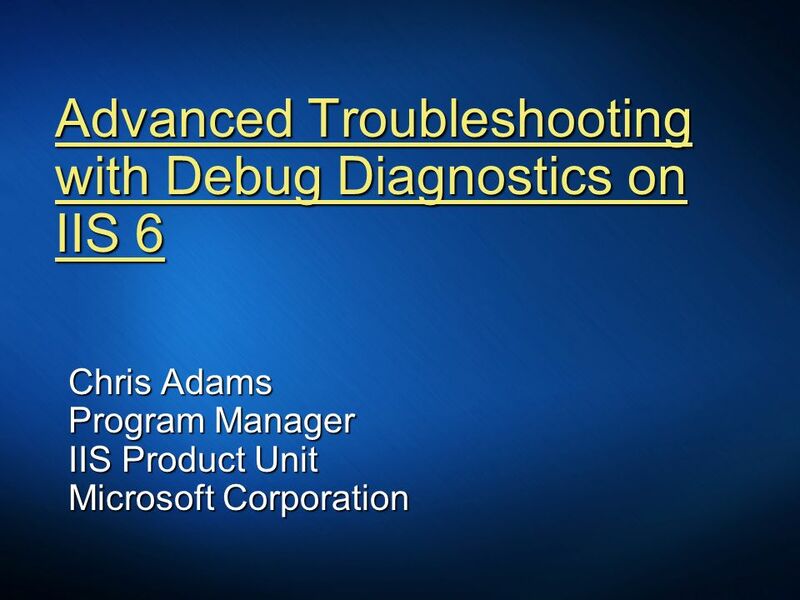 Download ppt "Advanced Troubleshooting with Debug Diagnostics on IIS 6"
How to Build Multi- threaded Applications in.NET Mazen S. Alzogbi Technology Specialist Microsoft Corporation. Module 13: Performance Tuning. Overview Performance tuning methodologies Instance level Database level Application level Overview of tools and techniques. Faith Allington Program Manager Microsoft Corporation WSV322. .NET Debugging for the Production Environment Part 1: Diagnosing application issues Brad Linscott Premier Field Engineering. SSRS 2008 Architecture Improvements Scale-out SSRS 2008 Report Engine Scalability Improvements. 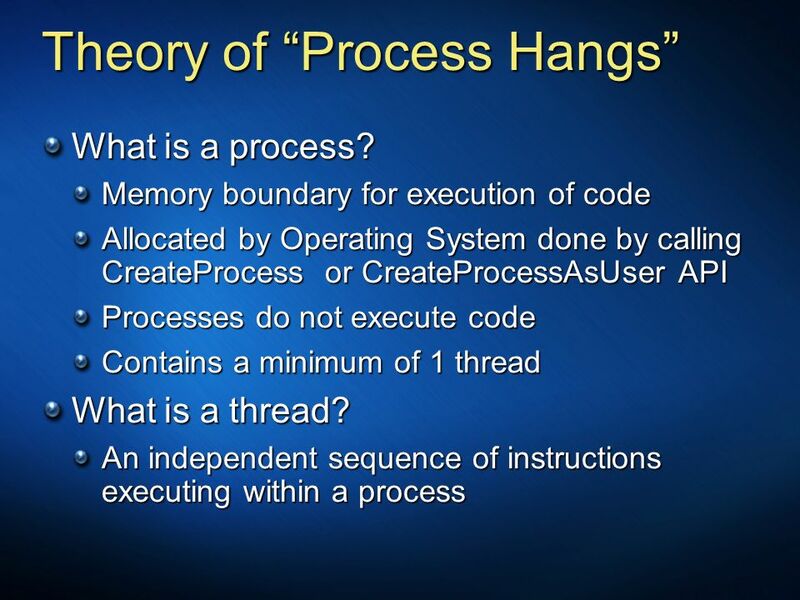 Operating Systems COMP 4850/CISG 5550 Processes Introduction to Threads Dr. James Money. 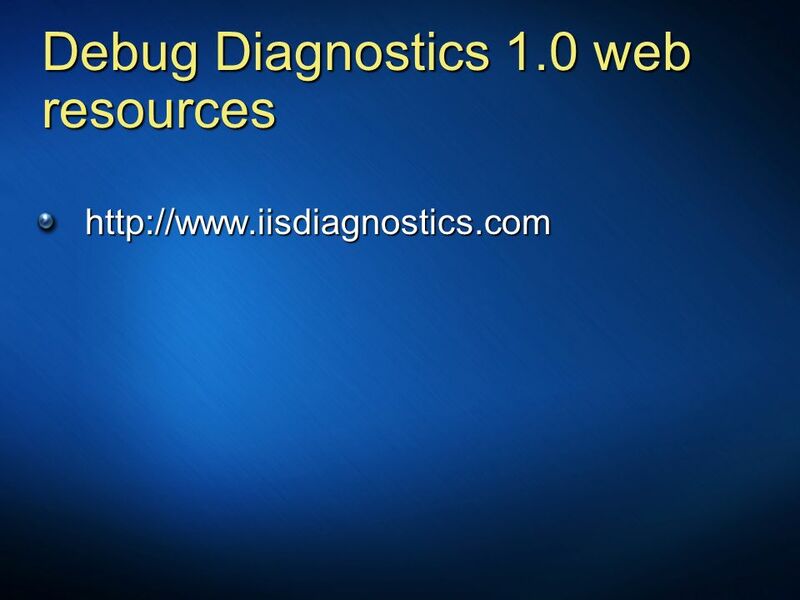 Advanced Troubleshooting with Debug Diagnostics on IIS 6 Draft 2.5 5/13/06 NameTitleGroup Microsoft Corporation. Introduction CSCI 444/544 Operating Systems Fall 2008. Module 20 Troubleshooting Common SQL Server 2008 R2 Administrative Issues. Threads in C# Threads in C#. Intro to Threading CS221 – 4/20/09. What we’ll cover today Finish the DOTS program Introduction to threads and multi-threading. Continuously Recording Program Execution for Deterministic Replay Debugging. 6/9/2015B.Ramamurthy1 Process Description and Control B.Ramamurthy. Architectural Support for OS March 29, 2000 Instructor: Gary Kimura Slides courtesy of Hank Levy. Page 1 Processes and Threads Chapter Processes 2.2 Threads 2.3 Interprocess communication 2.4 Classical IPC problems 2.5 Scheduling.